So first off was an imaginary trip to the Indian Ocean (don’t mind if I do!) to the British Colony of Ceylon, which we all now know as the beautiful Sri Lanka! You may notice this tea is called ‘Ferguson’s Ceylon’ which is inspired by ‘Ferguson’s Ceylon Directory’, a documented history of the country originally published in 1859. By combining the rich history described in this directory, with Sri Lanka’s stunning scenery, you can see why so many people are exploring these lands for luxury holidays. Most people are drawn to the golden sand beaches, timeless ruins and impressive wildlife but us tea types would probably make a beeline for their tea estates given half the chance! Or taking it further, you can even stay in a colonial tea planter's bungalow! Ceylon Tea can be found on a variety of Sri Lanka’s tea estates and it’s therefore thought of as one of their specialities. You may therefore be forgiven for thinking you’ve tried Ceylon before - but not so fast because Ceylon tea actually varies in taste between estates! As with all tea-growing areas, this is down to the geography of the estates and the altitude in particular. I’ve got to say, the altitude from the Low lying Ratnapura District has definitely affected the taste of Chateau Rouge’s loose leaf Ceylon tea - but in a totally brilliant way of course! So good in fact, that they haven’t confused the delicate flavour with another by mixing it into a tea blend by the time it reaches us! 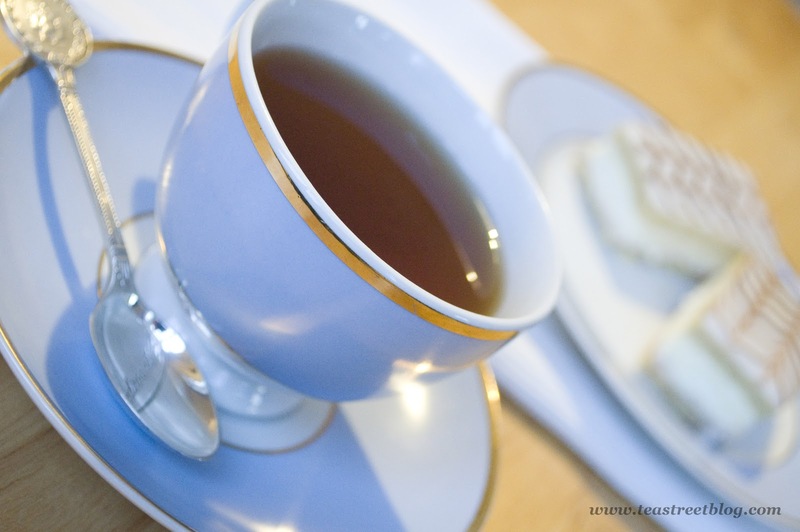 I personally like the richness of a black tea in these colder months (not tropical here, is it darlings!) and find that loose leaf tea is the best way of infusing a balanced brew. Ferguson’s Ceylon can be brewed to taste and I preferred a delicate lighter infusion with a warm copper appearance, although a longer brew will become delightfully dark and tangy. Either way, this has a medium body just perfect for me as I’m always on the lookout for black teas that taste good without milk. Some of us are yet to be convinced that tea without milk isn’t a horribly bitter experience (you know who you are!) but Ferguson’s Ceylon is smooth and soothing and I dare you to try it straight up with a twist, in the form of a pretty French pastry during your Chateau Rouge Afternoon tea! Luxury tea, it’s worth noting, can be an ethical tea for everyone and I was pleased to see the Fair-trade, Rainforest Alliance and ethical tea partnership stamps of approval. Does all of this sound tempting? Well, Chateau Rouge is offering 20% off of your orders of Ferguson's Ceylon this January in celebration of their new shiny Gold award! Just enter TASTEGOLD at their checkout!